Asus VivoBook S Is A Budget Notebook With A Punch, Price Starts At Just USD 499! Home / asus / news / pc / Asus VivoBook S Is A Budget Notebook With A Punch, Price Starts At Just USD 499! 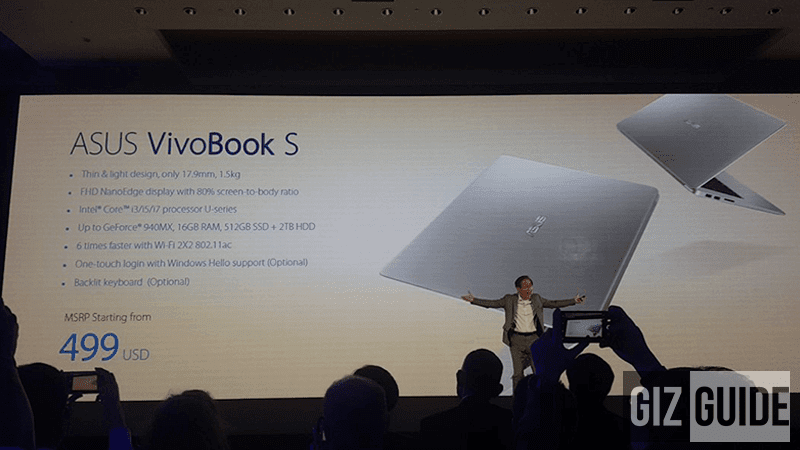 Apart from the sleek and slim ZenBook Flip S convertible, Asus has also introduced the VivoBook S, an affordable laptop that packs some serious punch! The new Asus VivoBook S also has a light and thin aluminum chassis with 17.9 mm thickness at just 1.5 Kg. It features a NanoEdge FHD 1920 x 1080 display with 7.8 mm slim bezels at 80% screen to body ratio. Screen size to be confirmed. It has an aluminum chassis that is 17.9mm thin and weighs 1.5kgs. Open up the notebook and you’ll see its display with extremely thin bezels at 7.8mm; giving it a screen to body ratio of 80-percent. Inside, the laptop is powered by either Intel Core i3, i5, or , i7 U-series, up to GeForce 940MX, 16 GB RAM, and 512 GB SSD + 2 TB HDD. It also supports super fast charging 60% with charge in just 49 mins. It also has WiFi 2x2 802.11 ac with up to 6 times faster speed. There's an optional backlit keyboard and one touch login with Windows Hello support. Price starts at USD 499 or around PHP 25K only. We'll complete the rest of the missing details soon.